Anyway, I bought the wool I liked in the amount I needed, which was a lot. I decided to get 7 balls of King Cole Big Value DK* in Blizzard. It’s quite a lovely colour and the little brown specs add a rustic feel to it. So, I received the wool and I printed out the pattern. And…I was completely stumped. I could not, for the life of me, understand most of it. I appreciate the efforts of whoever translated it but it’s not the greatest job. I should know, I’m a translator by profession. Nonetheless, I did try reading it a few more times in order to understand something but it’s very complicated. I gave up in the end. 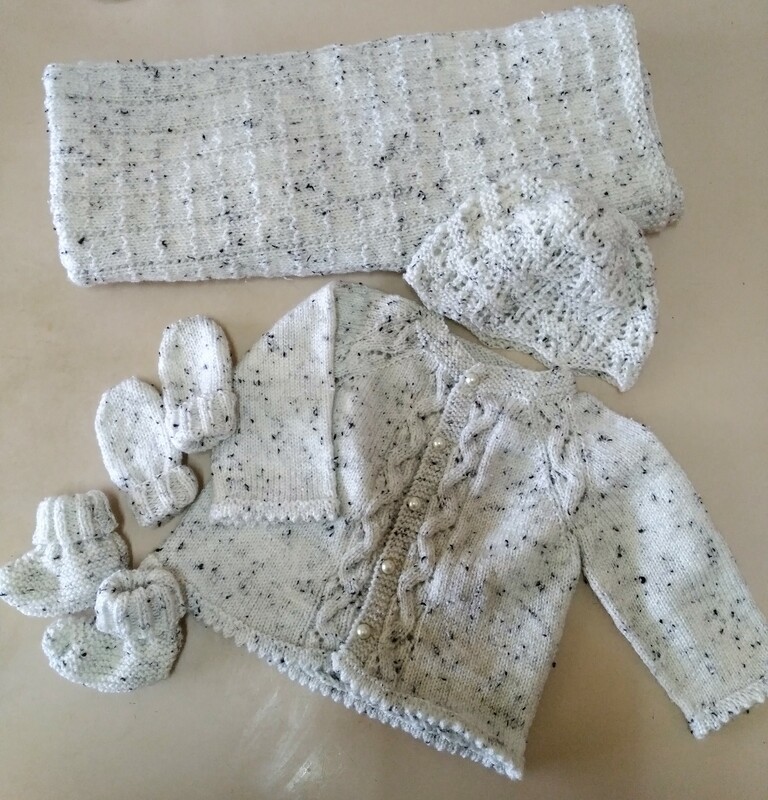 I tried to find something else which caught my eye but nothing really took my fancy, so in the end, I decided to fall back on a pattern I’ve already used before – the Sunnyside Baby Cardigan. It’s a free pattern and it’s adorable. I used the braid pattern for this one as it’s easier and you don’t have to faff around with a cable needle. (Love cable patterns but they’re a pain). You can see the finished product below. For the buttons I bought these beautiful pearl shank buttons* in cream and in a 10mm size. They come as a set of 10. I only needed 5 for this project but I gave the rest of them to my friend as spares. Next up came the baby hat, mittens and socks. I used this pattern for the hat. It’s adorable and has a really nice pattern, and it’s also free to download. The best thing about it is it could fit for many years after. I tried it on myself and it fit me too funnily enough. For the mittens, I used this other free pattern. They’re so easy to make and so cute. I made the thumb-less mittens since babies have a tendency to scratch themselves. Mind you, I did have a bit of trouble when joining the seams for the mittens… I guess I was a bit tired and wasn’t thinking straight but it took me three tries in total to get it right! Third time’s the charm, they say. For the socks I used a favourite pattern of mine which is also knitted flat and then joined at the seam. And it’s also free. Don’t they all look adorable? But you know what! I only used less than three balls of wool out of the seven that I ordered. I started thinking about what else I could make to add to the set since I didn’t want to waste the wool (not that it’s ever wasted, mind you). What else but a blanket to go with the set? I hunted around for a few more patterns and found a really cute one. Again, it’s a free pattern and it has two different designs. I chose the squares pattern. In the end, I barely used the fourth ball but the blanket came out pretty nicely and big enough for the baby to use for a couple of winters or three. So, I guess that’s it for the baby fever series, for now at least because I already have a friend who’s pregnant for the second time – the little boy who has the star pattern set in part 1 is going to have a little sister now. If you haven’t read the other parts to this series yet, you can find part 2 here, part 3 here, and part 4 here. Let me know in the comments what you think about this series and I would love love love to see any of your creations. Until next time fellow knitters/crocheters. Oh and a big Happy Mother’s Day to all mothers, people who have taken on the role of mothers but most of all, mothers who’ve lost their little angel(s). * This is an affiliate link. I earn a small affiliation percentage with every purchase made.